From various Internet articles the antenna described here is said to be ideal for long-distance communications on low power, it supposedly wins over a quarter-wave vertical with dozens of radials, an end-fed half-wave vertical and a high dipole. Developed by HB9SL (Fritz Demuth, SK) it’s called the ” Vertically Polarized 2 Element ” VP2E antenna. The HB9SL antenna has the following features: it emits at a low angle towards the horizon, about 26 ° (effectively 20 – 40 °), it has vertical signal polarisation, and the antenna gain is about 3 dBd! The antenna does not require a Balun and, most importantly, high masts. The radiation pattern is almost circular, the maximum radiation/gain point exists in the direction of the longer wire – i.e. away from the feed point. 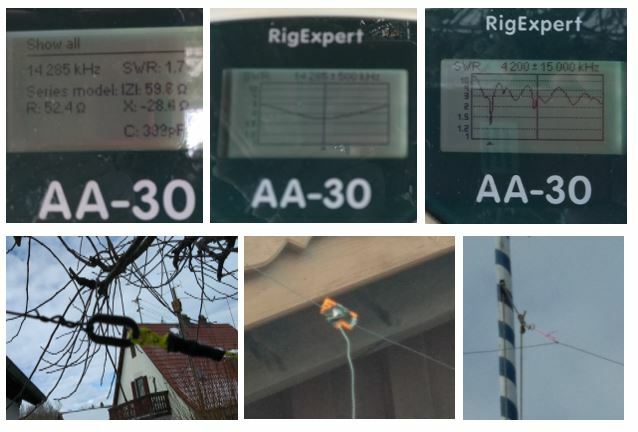 The following article is related to a 14MHz version of “Vertical Polarized 2 Element”, using as a mast a 4.2 Metre fiberglass pole. For 14MHz a run of wire with a length of 20.8 meters is fixed to the top of the mast exactly at the midpoint. Wires go down and are fastened with cords to pegs with antenna ends raised off the ground. On one side, a distance of 6.3 meters from the end of the antenna, a break is made, a plate is inserted to form the insulator and a 50-ohm cable is soldered there, no Balun is necessary, the centre core of the coax is connected to the longer section and the braid to the shorter one. In this build the length of the coax was approximately 7 meters (avoid the coax being a ½λ long). The HB9SL antenna design was tested with the program MMANA, which showed that sometimes the feed point is better moved a little higher than in the author’s design. Since the weight of equipment is important when portable, chose a wire which is light, flexible, and does not tangle or break easily. 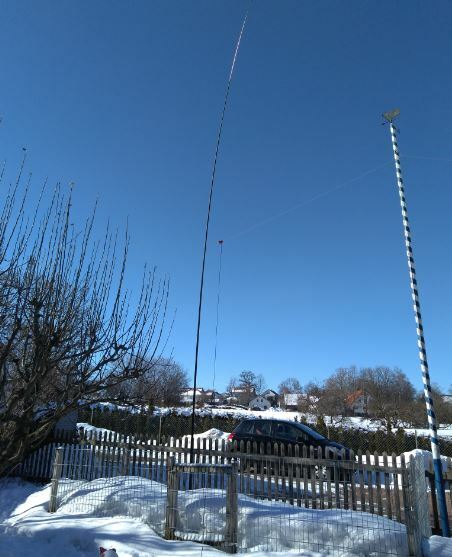 Due to the fact that the HB9SL antenna does not need a high mast, its wind-resistance is low and practice if the base cannot be secured it is sufficient to add one guy rope (with the antenna wires forming the other two) . Please note that any mast used with this antenna should be non-metallic. A fiberglass mast fits this role perfectly. The red arrows in the diagram below show the angles of maximum radiation. Measurements of the SWR for this 20m version using an MFJ-259 analyser gave the following readings: 1.5 – 14.0, 1.1 – 14.1, 1.7 – 14.3 MHz. The resonant point is quite sharp, so after constructing the antenna, it must be trimmed to the required frequency within 20m. Sizes for other bands. For 7 MHz, you need a mast height of 6 meters, the total length of the antenna wire will be 41.8 meters. The length of the wires to the middle 20.9 meters. The feed point is located at a distance of 15.4 meters from the lower end. The lower ends of the wires must be raised one meter above the ground. Everything else is as described above. For the 3.7 MHz band, a mast height of 7 meters is needed, the total length of the antenna is 79.8 meters. The length of the wires to the middle are 39.9 meters.The feed point is 32 meters away from the lower end of one of the elements. The lower ends of the wires must be raised 1 meter above the ground. He used all standard dimensions except the height. In his case H1 was 55 meters. Top band conditions were not very good. He only had a few QSOs, the highlight was being called by SU9HP in Egypt for a new country for him. He states that the antenna showed reasonable directivity (see diagram above). Then he tried the antenna on 80 with an antenna tuner and worked over 80 North America stations! Including OK, MS and KY states. Setup was an IC756ProIII driving an Acom 1000 amp (800W output due to low mains supply voltage). Click Multi-band VP2E calculator with link lengths V2 to download my Excel calculator to insert your own frequencies. this updated version of the spreadsheet also has a section documenting the lengths of individual sections if you want to make a linked version of the antenna (see below). Entering your required frequency in the yellow field recalculates the other fields and also those in the linked antenna calculator (see later). Consistently into the US south-east, Ireland, Iceland and also Greece. The antenna was running roughly NNW-SSE unfortunately I don’t have enough room to be able to turn the antenna around to check it directive abilities. That will have to wait until I can get it onto a large open SOTA summit. Directional Testing – Friday 1st. February 2019. Well I finally decided to give up trying to find a wide open space in the country to test out my new antenna. The amount of ice and snow around means that the places I would like to use are simply not accessible. I decided to test to see if there was ANY directivity from the antenna at all in my garden. 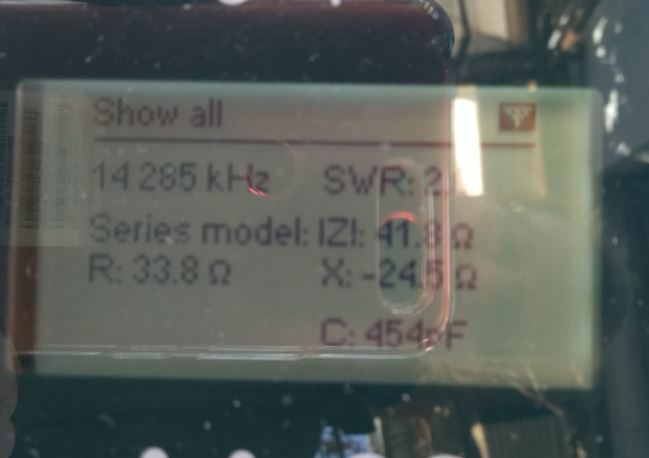 With limited space and buildings all around this was never going to be a conclusive test and bad propagation conditions also meant the number of stations receiving my 200mW signal from a WSPRLite transmitter was going to be low as well. Rather than hope for a better location and better conditions however, I decided to go with what I have. 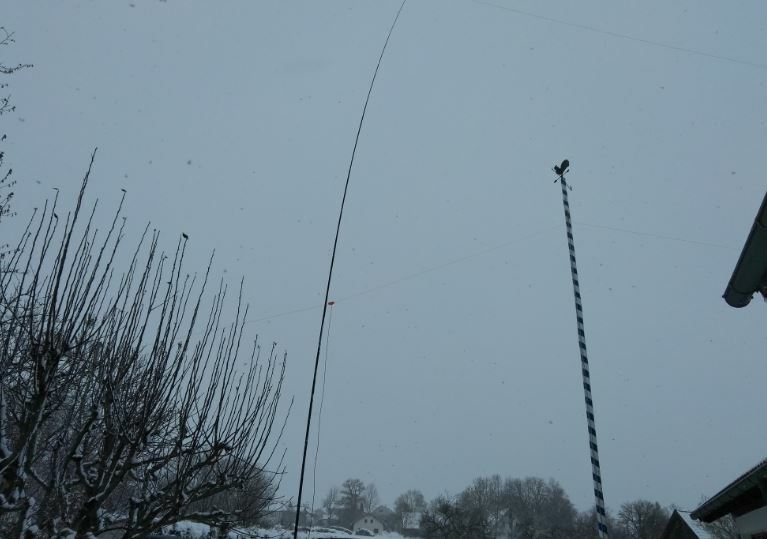 So using the convenient flagpole I raised the centre of the antenna up and then ran the long side (i.e. the side without the feed-point in it) across our common car parking and garage access area, fastening off the cord on the fence on the other side and then hanging a yellow cloth on the spot where someone coming out of the houses might walk into. Luckily no one came out or went in during the tests as, as well as possibly de-tuning the antenna there may have been some time taken up while I had to explain what I was doing and why. The other side of the antenna sloped down from the flagpole almost (but not quite) in-line with the other side of the antenna, under (but not touching) my tilted over VHF steel mast and the cord tied off to the fence. The positioned the antenna wire roughly from West to East, with the feed-point on the eastern side, meaning the antenna supposedly will have some gain to the west. I now connected up the WSPRLite unit, synchronised its start against an atomic clock App and let it run for about 10 minutes before stopping it and then moving the ends of the antenna around. The end that had been across the car park pointing to the west moved into the garden and ran out to a tree in a northerly direction. The eastern end of the antenna now should move to the south. Unfortunately there is no enough space in the garden to fit this in and the compromise was that it ran SSE rather than due south and then the end of the wire hung down in the tree after going over a branch. This was the side of the antenna with the feed-point in it, so the antenna should now have some gain in a “sort of” northerly direction. After the 10 minute break to move the ends of the antenna I ran the WSPRLite for about 10 minutes again. As the data is in reverse sequence, the top six entries are from when the antenna was “beamed” ‘sort of’ north and the bottom five entries from when it was “beamed” west. Luckily we have reports from Iceland in both batches and so we can compare those. Averaging the readings into TF while the antenna was “pointing” west we get an average signal of -18dB comparing this to the average of the signals when the antenna was “pointing” NNW-ish which was -12dB gives us a difference between the end-on direction and the side-on direction of 6dB. That is more than expected and could be caused by Iceland being in one of the side nulls of the antenna pattern or (more likely) by the various obstructions around the antenna. These results suggest the antenna is directional to an extent but the results are not conclusive and a test in a truly unobstructed location is really needed. It is also possible that in the 10 minutes taken to “rotate” the antenna, band conditions could have changed. While packing away the antenna, I measured the short and long sections of the antenna as previously trimmed to give resonance on 14.285MHz using an antenna analyser and the short section is 6.32m long as compared to the calculated 6.30m and the long section is 14.75m long as compared to the calculated 14.48m – so fairly close. The actual length is affected by the velocity factor of the wire used, however I am fairly confident that should an antenna be cut exactly to the settings found using the calculator, it would indeed be “close enough” to work. Thin light antenna wire (100m reel) Price € 9.22 (Hi-Viz yellow recommended). “invisible hardware” (Feed-point T + 2 x end insulators) Price €3.26. Coax feed-line (10m RG-174A no plugs fitted) Price €8.88 (add required BNC or PL259 plug yourself (a BNC plug costs €2.18 from SOTABeams)). Cord (Hi-Viz recommended) Price €9.50 for 50m (need < 10m). TOTAL COST OF COMPONENTS: € 36.90. OR …… Simply buy the Linked Dipole kit at €17.04 and add the mast top insulator (nr. 2 above) €2.18, antenna wire (nr. 1 above) €9.50, feed line coax (nr.4 above) €8.88, and a BNC plug €2.18. Total cost € 39.78 and you get two winders to keep the antenna tidy and If you want to try to make a multi-band version you already have the link pieces and crocodile clips. – supply your own mast or buy the appropriately sized one from SOTABeams (Tactical, Tactical-Mini or Mini-Mast). Or hold up with a rope over a tree branch connected to the centre wire support. So what now ??? – Multi-band. Well while waiting for the weather to improve I wondered if a linked version of the antenna would be practical. In a similar way that you can have a linked dipole. So I got busy and added a second calculator into the spreadsheet (listed above) which supplies the needed lengths to create sections of the antenna so that it could cover multiple bands. Initially I started with a calculator for the classic 20m – 10m 5-band antenna. I later extended this second calculator to cover from top band through 10 meters. You don’t have to put links in for every band, just the ones that you want to have. If you exclude band links, simply add all the lengths of the intervening link wires together to get the length of the link wire you need. My first linked VP2E was one for 17 & 20m which with the link inserted it operated on 20 metres the same as the antenna with no link with the links on each side open, it is resonant on 17 metres. Once I was happy that the linked concept worked, I took my 20m (unlinked) VP2E and extended it for 40 metres. I have only tested this on the antenna analyser so far but it is resonant on the expected 40 metre frequency simply by using the dimensions from the calculator spreadsheet. No trimming was needed. The testing and experimentation with these antennas is only in its early phases. When extending an existing VP2E antenna, as I did to add 40m to the 20m antenna, you need to move the support point for the middle of the antenna. For practical physical reasons alone, it needs to be the mid-point for the antenna wires on the lowest band. As you can see, it’s 2:1 SWR and 34 ohm impedance – Perhaps moving the feed point a little would help but before doing that I need to get both antennas out onto a nice large summit where no surrounding buildings can affect the antenna. 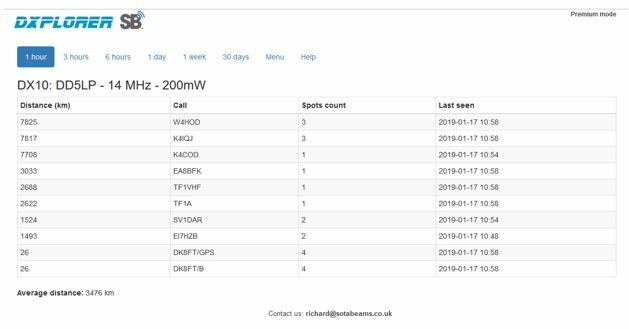 I managed to do that on 03/03/2019 and here is my report: Despite bad radio conditions the 20m version of the antenna performed well. Unfortunately I was unable to perform any comparison tests against the dipole that I normally use but the fact that there is twice as much antenna in the air I’m sure is making a difference. I am trying to organise another amateur to help me with further comparisons and testing both of the 20/17m VP2E and well as the new 40/20m VP2E. Of course the weather needs to stabilise somewhat before I can do a comprehensive test and better propagation wouldn’t harm either! Further directional testing (40/20m linked VP2E) 25/4/2019. While working portable from GMA “summit” DA/AV-077 Kramerberg / Beaches on the Air BOTA 19685 Windachspiecher I did some more directivity testing as I had a wide open space with relatively few obstructions. I performed the tests by using my WSPRLite unit and “pointing” the antenna in three directions (WSW, NNW & WNW). As the WSPR system is a slow beaconing system, there is the danger that the results may be incomplete or affected by propagation changes on the 20 metre band which I used. 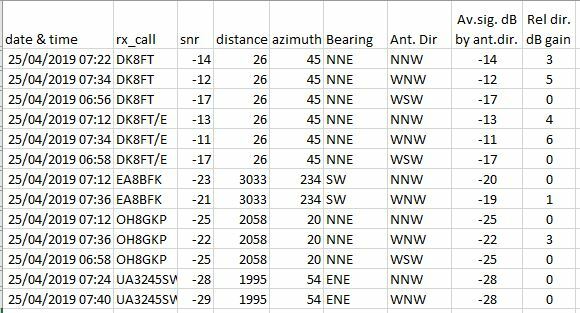 Of the results gathered I only took the values from stations that received my 200mW signal in more than one antenna direction and compared the SNR values to see if any ascertainable “gain” can be found. This amount of data will not enable a radiation pattern diagram to be produced rather it can only indicate that the antenna has nulls and is not uni-directional. Had I known which WSPR receiver stations were going to be able to receive me I may have targeted one or two and adjusted the antenna direction for maximum SNR at that station and hence found the “beamwidth” of the antenna. Perhaps next time. 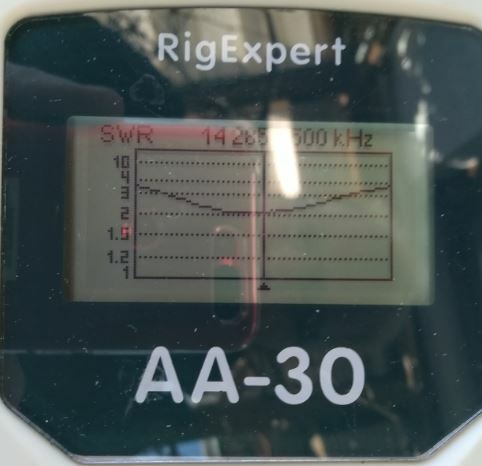 The relative directional gain figure is based on the lowest signal received by the station – setting that as zero and then with the antenna in different directions noting how much stronger (less dB under the noise level) the signals are. The only conclusion from this test is that the antenna does have nulls and peaks in its pattern of between 3 and 6 dB and is NOT equally omnidirectional. As luck would have it, in no situation did I actually have the antenna exactly “pointed at” the receiving station, which would have enable me to confirm that the antenna radiates more off the “front” side (the side without the coax-feed) than elsewhere (or possibly front and back radiation are about the same but there are definite side nulls). It looks like DK8FT is a semi-permanent WSPR receiving station and being not so far away is less likely to be affected by propagation, so another test “targeting” (i.e. only looking at the readings from) this station would be a good option. Until then, we will need to continue to hope that the radiation pattern in the diagram below is somewhat accurate. The antenna certainly appeared to work well on my recent SOTA activations.